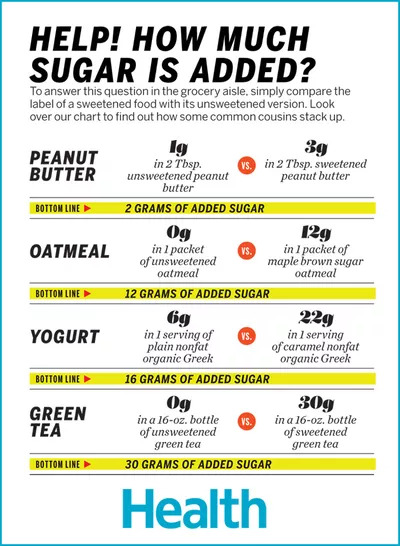 While the Food and Drug Administration is working to make added sugars a part of future food labels, for now you're stuck with the combined total grams of both types. Still, you're not doomed to eat more sugar than you need. Use this simple trick to spot it out. Of all the ingredients in your food, sugar is by far the sneakiest. It's added to all kinds of products you wouldn't expect, such as peanut butter, oatmeal, and bread. Making matters more complicated, food manufacturers aren't yet required to tell you exactly how much sugar they've added to their products. That means naturally occurring sugars—the kind found in healthy foods like whole fruits, vegetables, and dairy products—aren't separated out from added sugars. Instead, food labels list the combined total grams of both types. Many packaged foods contain both naturally occurring sugars and added sugars.